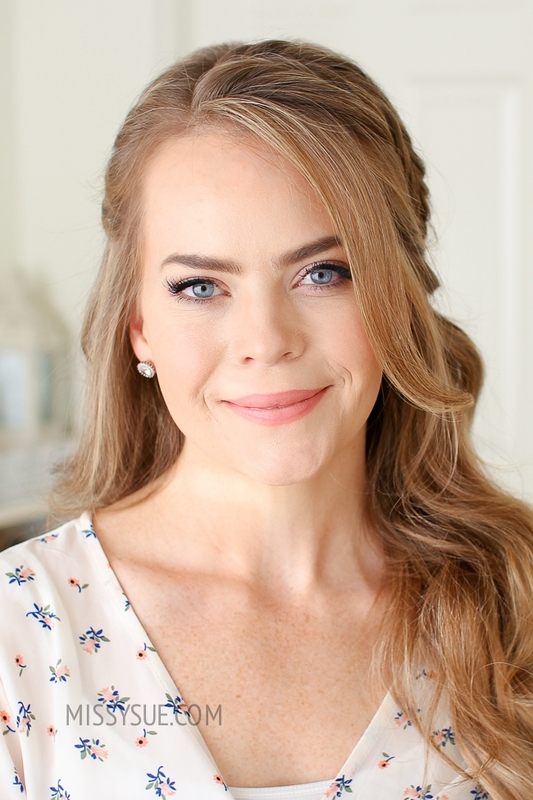 Two of my most requested tutorials are everyday hairstyles and half updos. 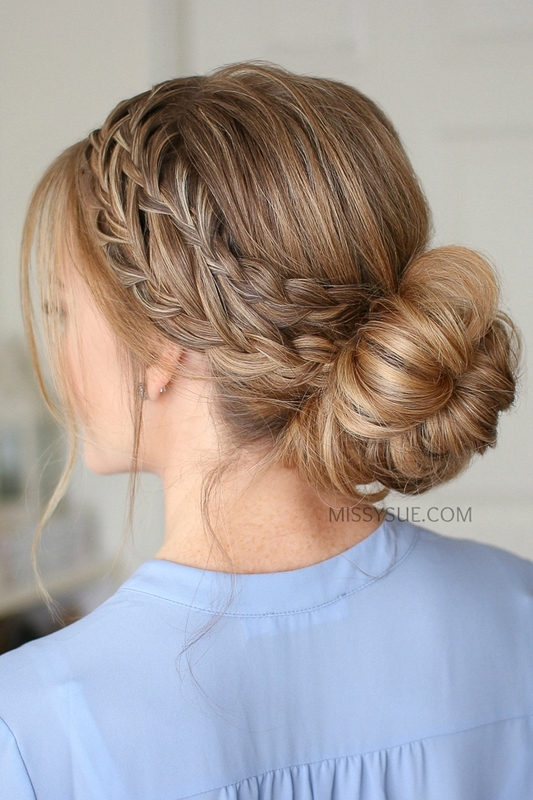 This hairstyle is a little fancier than your typical everyday style, but I think it’s so gorgeous and wearable for so many different occasions. To prep my hair for this style, I curled all of it away from my face with a 1″ curling iron. Step 1 / Begin by parting the hair on the right side, though you could part it wherever you normally prefer. Step 2 / Divide out any hair to frame the face and then a larger section on the heavy side of the part and clip this hair out of the way. Step 3 / Pick up a small section near the part and divide it into three smaller pieces. Step 4 / Create a french braid crossing the side strands over the middle strand while incorporating new sections into the braid and working down towards the left temple. Step 5 / Now braid the section a little further down and then go back over the braid and gently pull on the edges to make it a little fuller. Step 6 / Slide a bobby pin over the bottom and smooth down any flywaways with hairspray. Step 7 / Let down the front section of hair and create a fishtail french braid. So pick up a section near the part and divide it into two pieces. Step 8 / Cross small sections from one side over to the opposite side while incorporating new sections into the braid until it reaches the left temple. Step 9 / Now only bring in hair to the left side of the braid until the braid reaches the left ear. Step 10 / Then braid the section to the bottom before pulling on the edges to make it fuller. Step 11 / Then slide a bobby pin over the bottom so it doesn’t unravel. Step 12 / Now create a second french braid with the hair on the right side of the head until it reaches about an inch above the right ear. 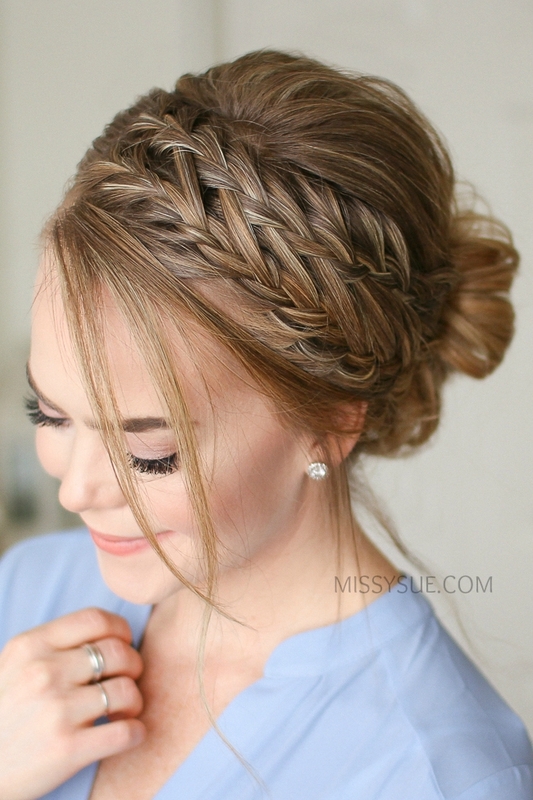 Step 13 / Braid the rest of the section to the ends and slide a bobby pin over the bottom. Step 14 / Now pick up a section of hair on the right side underneath the previous braid and braid this section in a regular fishtail braid, dividing it into two sections, taking small pieces from one side and crossing it over to the opposite side while working all the way down to the bottom. Step 15 / Go back over the braid, pulling on the edges to make it fuller and slide a bobby pin over the bottom. Step 16 / Next bring all four braids around to the back of the head. Step 17 / With the top two braids, create a gap in the left braid and pull the right braid through the gap before pinning the braids against the head. Step 18 / Then take the two lower braids, create a gap in the right braid and pull the left braid through the gap, and then pin them against the head with bobby pins. Step 19 / Remove the bobby pins from the ends of the braids and brush through them. Step 20 / Set everything in place with hairspray. For today’s tutorial, I thought it’d be fun to share my two favorite messy buns. Whenever I don’t want to do my hair, I throw it into a messy bun. It’s so simple and quick and I can usually get it right on the first try. I have featured these in tons of other tutorials but I love having a dedicated video just for this because I get asked all of the time how I do them. There is an older tutorial showing how to do these but I tried to edit this one without any cuts so hopefully you can see what I’m doing more easily. Step 1 / Start by brushing all of the hair up towards the top of the head. Step 2 / Take a hair band and slide it halfway over the ponytail. Step 3 / Pick up the ponytail with the thumb and pointer finger, then put the pointer finger in the hair band. Step 4 / Twist the hand under, towards the back of the head. Step 5 / Let go with the thumb and place it in the hair band. Step 6 / Grab the bun with the left hand and pull the hair band over the bun with the right hand. Step 7 / Now pull on the back loop to tighten the bun against the head. Step 8 / Then rearrange the front loop so it’s similar in size to the back one. Step 9 / Pin down the edges of the bun with bobby pins so there aren’t any gaps in the bun. 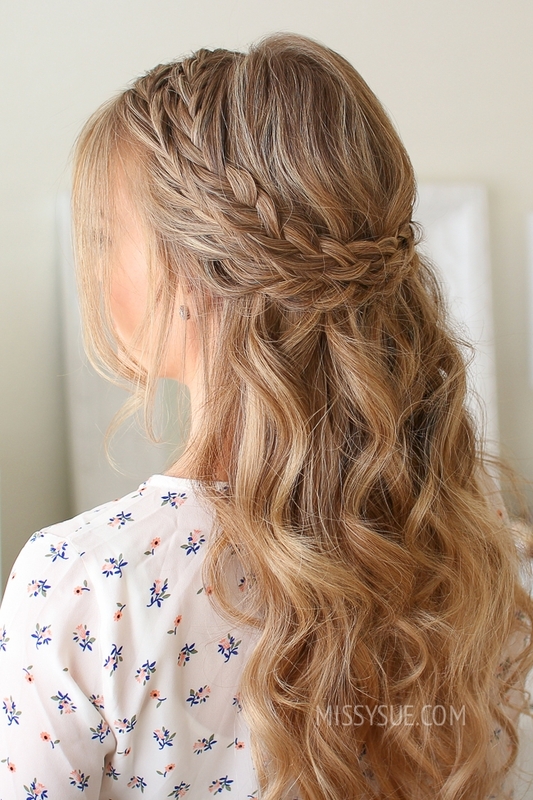 Step 10 / Set the style with hairspray and smooth down any flyaways. Step 1 / Begin by brushing all of the hair up towards the top of the head. Step 2 / Wrap a hair band over the ponytail. Step 4 / Use the left hand to spread the ponytail around the hair band. Step 5 / Then wrap the hair band twice more of the bun. Step 6 / Now pull on the edges of the bun to tighten it against the head and make it fuller. Step 7 / Take the ends left sticking out, loop them back towards the bun and tuck them into the hair band. Step 9 / Set everything with hairspray and smooth down any flyaways. Step 1 / Begin by parting the hair where you normally prefer. I’ve placed mine on the right side. Step 2 / Pick up a small section on the left side of the part and divide it into two smaller sections. Step 3 / Take a small piece from the right side and cross it over to the left side. Step 4 / Take a small piece from the left side and cross it over to the right side. Step 5 / Start incorporating new sections of hair into each side of the braid so cross a small piece from the right over to the left, pick up a new section and cross it over to the left side. Step 6 / Then take a small piece from the left side, cross it over to the right, pick up a new section and cross it over to the right side. Step 7 / Repeat those steps for three stitches of the braid. Step 8 / Now stop adding in new sections to the right side of the braid and only bring in new sections to the left side of the braid to create a lace fishtail braid. Step 9 / Continue the lace fishtail braid, keeping it high on the head and working along the hairline until it reaches the nape of the neck. Step 10 / Then continue the braid a little further down and slide a bobby pin over the bottom so it doesn’t unravel. Step 11 / Now repeat those same steps and create a second lace fishtail braid on the right side of the head. Step 12 / With both braids done, combine all of the hair together and use a hair band to tie it into a ponytail. Step 13 / Then remove the bobby pins from the ends of the braids and unravel them. Step 14 / Take a small section of hair from the ponytail, wrap it around the hair band and secure it underneath with a bobby pin. 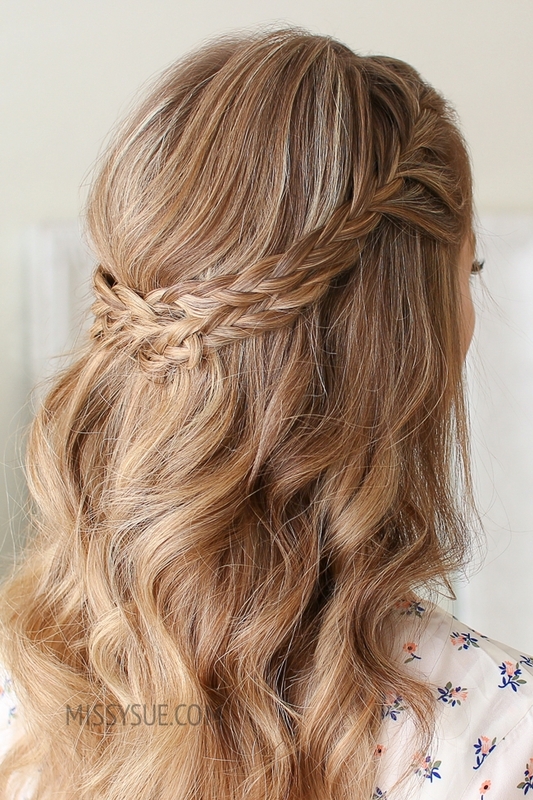 Step 15 / Spray the style with a firm-hold hairspray and smooth down any flyaways. Step 16 / Optional: Use a 1 1/4″ curling iron to curl the ponytail. If you loved the Double Braided Ponytail, then you’re going to love todays tutorial! It’s the exact same concept but with a messy bun instead, whaaaaat?! I love this braid so much I simply couldn’t resist creating a second hairstyle with it. It’s a fun way to dress up your everyday messy bun and once you get down the technique, it’s totally doable. Do I even need to mention it’s heatless too? Perfect for summer, wink wink! Step 2 / Now divide out the front section of hair on the left side of the part. Step 3 / Then divide this front section into two smaller pieces and clip away the forward section. Step 4 / Now pick up a small section of hair near the part line and divide it into three pieces for the braid. Step 6 / Then cross the right strand over the middle and bring a new section into the braid. Step 7 / Drop down the left strand and pick up a new section of hair from underneath and cross it over the middle strand in its place. This is what will create the waterfall strands for the second braid. Step 8 / Repeat those steps, crossing the right strands over the middle while adding new sections into the braid, dropping down the left strands, adding a new section into the braid until it reaches around towards the back of the head. Step 9 / Then braid the rest of the section to the bottom and cross a bobby pin over the end so it doesn’t unravel. Step 10 / Now with the front section of hair, pick up a small section near the part and divide it into three pieces for the second braid. Step 11 / Start by crossing the right strand over the middle and then the left strand over the middle. Step 12 / Cross the right strand over the middle and add in the first waterfall strand. Step 13 / Then cross the left strand over the middle, pick up a new section and cross it over and into the braid. Step 14 / Continue creating a french braid with this front section of hair, crossing the side strands over the middle, adding in the first four waterfall sections on every other stitch of the braid and then the last four strands on every stitch of the braid. Step 15 / Then braid the section a little further down and slide a bobby pin over the bottom. Step 16 / Now combine all of the hair together into a low ponytail and wrap it once with a hair band. Step 17 / Remove the bobby pins from the ends of the braid then twist the hair band over the right hand and spread the ponytail around the hair band with the left hand. Step 18 / Then wrap the hair band twice more over the hair to create the base of the bun. Step 19 / Pull on the edges of the bun to make it fuller and to tighten it against the head. Step 20 / Then with the ends left sticking out, loop them back towards the bun and tuck them into the hair band to finish the bun.